This is why I read the Daily Dish. Thank you to Andrew Sullivan (and your sources) for bringing this horrific piece of tripe to my attention. Click the link, if you dare, but be forewarned that you will encounter an unsettling preview of the kind of crazy rant you may be subjected to a week from today around the Thanksgiving table when your crazy Uncle Nuts makes inflammatory comments that everyone in the family easily dismisses with an exaggerated (though unnoticed by Uncle Nuts) eye roll. 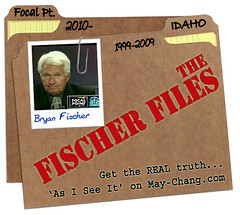 Here, the perpetrator isn’t Uncle Nuts, but Bryan Fischer director of Issue Analysis for Government and Public Policy at American Family Association. He begins by describing the most recent conferring of the Medal of Honor to an Army Staff Sergeant who rescued not one, but two of his fellow soldiers. This is well deserved, says Fischer, but then he somehow concludes, “We have feminized the Medal of Honor.” Apparently in recent years the Medal has been awarded only to people who have saved lives and not to those who “kill people and break things so our families can sleep safely at night.” Okay, so that’s obviously inflammatory. Never mind you with your assertion that the enemy on whom he inflicted said mortal wound was a spiritual enemy, or that the head of the serpent Fischer goes on to say that Jesus crushed is metaphorical. That doesn’t matter. “It’s about time we started also honoring those who kill bad guys,” Fischer insists. Fischer’s conclusion is obviously founded on a gross misreading of the Gospels. It is an insult to the soldiers who are awarded the Medal of Honor and a blatant example of his renowned sexism. I wish we could write this off as another doosey from old Uncle Nuts, but I can’t help but see it as one of a growing number of examples of how Christianity, when conflated with misdirected patriotism, morphs into a hideous civil religion that is consistently mistaken for true Christianity. And this is what we’re up against.